This letter from an enclosed Carmelite nun was addressed to the young women at the Voice of the Family conference Created for heaven: the mission of Catholic young adults in today’s world, Rome, 20 October 2018. We are very happy to make it available to all! To understand the contemplative life, which perhaps may seem an incomprehensible mystery, it is necessary to go back to the origins of monasticism. The first centuries of the Church, as we know, were characterised by the persecutions of the Roman emperors against the Christians who, with their blood, gave the supreme testimony of love. When the persecutions ceased under Emperor Constantine, the most fervent Christians – unable to shed their blood – retired to the deserts to offer God the martyrdom of their life, spent in the solitude of a life of prayer and penance. Contemplative life is born, therefore, as a substitution of the martyrdom of blood and, consequently, as the form of supreme donation to God. Through separation from the world, the monk or nun is the heir of the martyr. The monk is like the martyr not only for his asceticism and for his renunciations, for his heroic perseverance and for his special consecration to the Passion of Christ, but also for his voluntary solitude. Tertullian said that the martyr in prison is like a monk. And the monk in his cell is like a martyr. In the course of history, this aspect of the enclosure understood as voluntary imprisonment became increasingly relevant, assuming ever more precise rules, and in this way became one of the principal means of evangelising of Europe. St Benedict, in fact, with his famous rule, spread the Christian faith throughout pagan Europe not with preaching but with the presence of monasteries of monks, which constituted a living and silent preaching of the Christian faith. From the beginning, monasticism appeared as a powerful method of reform for the Church, thanks to its purity and its detachment from the world. Monastic life testifies to mankind that God exists and that His Kingdom, though beginning in this world, is not of this world. It was up to the monks to withdraw from the world, to live there as strangers and to be separated to become, as far as possible for human frailty, citizens of Paradise associated with the Angels of Heaven. The nuns remain in the house of God, in the monastery, in the cell, where enclosed in their Paradise which is “an open prison without chains” (St Bernard), while the world for them would be a prison. Separated from the world, they lead a hidden life, knowing that their vocation is not to preach but to pray and keep silence, since they will teach others not by word but by example. For St Bernard the nun “must help the earthly Jerusalem to seek the heavenly Jerusalem”. If religious life – in the broader sense – is an imitation of the life of Our Lord, and all the different forms of religious life imitate a particular aspect of the life of Jesus, the contemplative life imitates Jesus’s hidden life for thirty years, Jesus led into the desert by the Holy Spirit, Jesus in the solitude of the Cross, and finally Jesus in the Eucharist. It is love that urges us to always seek the Lord, to live in solitude with Him, to desire to know Him more every day, to be united to Him in a constant intimacy, collaborating in His Redemption. “You are the collaborators with God Himself and support of the weak and wavering members of his ineffable Body,” wrote St Clare to St Agnes of Prague. The ultimate goal of a nun is not different from that of other Christians; it is the perfection of charity. It is however – thanks to a special grace of God her specific vocation – as fully understood, the unique excellence of this end, of the greatness, purity and tenderness of God, whom St Francis loved to call “the Beautiful”. She has known “the great love” (Eph 2:4) with which the Father has loved her freely and understood that such love should be preferred to everyone else, love without measure until the total gift of self. The nun could not imagine even for a moment that she no longer loved the one who has loved her so much that He “gave Himself for her”, however, she also desires to respond with a greater love, with the gift of her life. The enclosure is therefore a choice of love, of the supreme love of a creature for her Creator. If the martyrs testify to their faith not through the word but through death, the nuns do it through the example of their hidden life with Christ. They witness that God exists, that there is a supernatural order of things, for which they live and in which they are consumed in the hidden life that the world despises. And yet, after all, the world understands the preciousness of this life, because, when it wants to persecute the Church, it usually always starts from the destruction of the monasteries: this is what happened, for example, during the French Revolution. “The monks are lighthouses that shine from above to illuminate those who come towards them from afar,” said St John Chrysostom. The first strictly cloistered form of life for women was given by St Clare of Assisi. It is said of her that she was a light which “remained enclosed in secret cloisters, and outside it emitted sparkling rays; it was gathered together in a strict convent, and it was sprinkled upon the entire age; it was guarded within, and it flowed forth outside.” (Bull of canonisation) Three centuries later in Spain, St Teresa of Ávila began the reform of the Discalced Carmelites, promoting solitude and the cloister as the indispensable ascetic means for the sanctification of the nuns and the building up of the Church. One of the main reasons that prompted the Spanish Saint to start the reform was the spread of the Protestant heresy by Luther’s disastrous action. 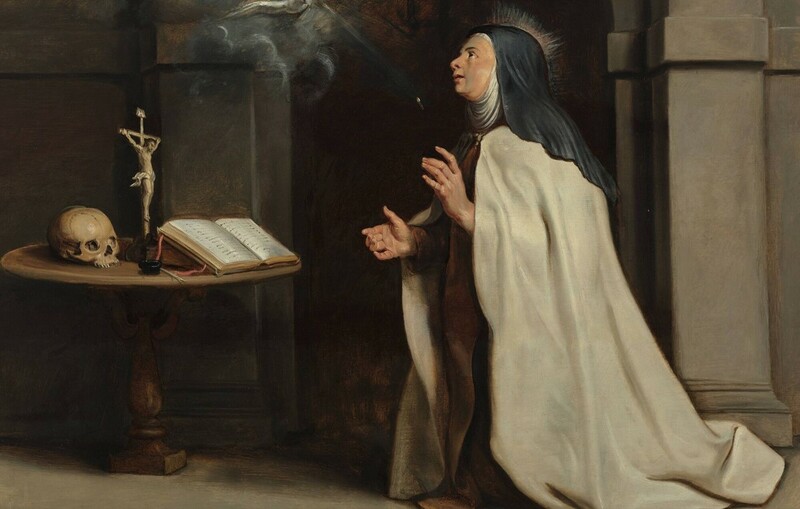 Since the reform of St Teresa, Carmel has generated many holy souls from the silence of its strict enclosure, some raised to the honours of the altars, others – the most numerous – remained unknown but no less important for the life of the Church. From the depths of the cloister, the nuns are the pulsating heart of the Church, as St Thérèse of the Child Jesus said – the angelic Carmelite of Lisieux, known all over the world, and declared by Pius XI “patroness of all missions”; she who at the age of 14 had wished to leave to evangelise the pagan lands, but then considered it more perfect “to sacrifice all the consolations and satisfactions of the external apostolate” and to choose a cloistered life “to suffer more in the monotony of an austere life and so save more souls”. With this act, Pius XI showed the whole apostolic dimension of the contemplatives, whose prayer embraces the whole world, although their visible apostolate is restricted and unknown. Young Thérèse of Lisieux possessed the zeal of the apostles, the ardour of the martyrs, the ardour of the missionaries, who are the different members of the Body of Christ, which is the Church. None of these vocations, however, satisfied her desire to love God, since she could not possess them all at the same time. Then she realised that the Church has a heart, and this heart throbs with love, and this heart gives courage to the martyrs, strength to the missionaries, constancy to the virgins. And she realised that to have all the vocations it was necessary to be that heart, that is, love. But to “be love” it was necessary to renounce all that is not God to live only for him, which is Love by essence: this she did by living in the dark solitude of Carmel. It is only love that nourishes this search for the Face of God. The nun is “the one in love with God” who wants to see His beautiful Face. “Love,” said St Peter Chrysologus, “cannot help but see what it loves, so all the saints valued very little what they had accomplished, if they were not to come to see God.” Love is unifying by definition: it cannot but desire the presence and possession of the Beloved. Now, this is exactly what contemplation accomplishes: since it is an act of knowledge inspired by love, it allows God to live in a special way in our hearts “as what is known is in the one who knows and what is loved in those who love,” teaches St Thomas. When one loves, it is then impossible to wait for the other life to see the face of the Beloved: one seeks it and finds it in this life through contemplation, which is a simple glance at the beatifying Face of God. Cloistered life is therefore a choice of love, of the most radical love that can be chosen by a human creature. And the model of this choice is the Blessed Virgin, the one whose origin – like all her life – disappear in silence. The Gospel teaches us that she received the Angel’s announcement in the solitude of her house in Nazareth, and throughout her life she kept the words of the Son in the silence of her heart and in her hidden life. And just as the Holy Virgin was not only the physical mother of Christ, but also the spiritual mother of Her members who form the Church, generating them under the Cross, so nuns are called to participate in this unlimited fruitfulness of the Mother of God and have all men as their children. St Ambrose said that the nuns, even if they do not know the pains of childbirth, have “a most numerous posterity”. And this happens by bringing the grace of God into the hearts of men through prayer and penance. This is the work of contemplative life.